May prove to be the feel-good movie of the year...the only problem is that we can't enjoy the live performances in their entirety. 103 min. Rogue Pictures. Director: Michel Gondry. Cast: Dave Chappelle, Kanye West, Dante 'Mos Def' Smith, Erykah Badu, Fugees (II). In what may prove to be the feel-good movie of the year, the hottest American comedian gathers old friends and new acquaintances for Dave Chappelle's Block Party, a concert extravaganza staged on a Bed-Stuy street corner and caught on film. After taking a notorious, unscheduled leave-of-absence from the pressured environment of his $50 million-dollar Comedy Central contract, Chappelle's catch phrase "I'm rich, bi-atch!" is more tongue-in-cheek than ever. And yet what makes Dave Chappelle's Block Party so admirable is its underlying sincerity. Chappelle shows his politically militant side by enthusing over rap duo Dead Prez and insistently asking, "Who shot Biggie Smalls?" (a question ever on the minds of black entertainers, Chappelle points out). Chappelle also brings out activist Chairman Fred Hampton Jr. of the Prisoner Of Conscience Committee to encourage the crowd to keep "heads up, eyes open, fists clenched." Clearly the comic can bring people together with provocation, but he expends significantly more energy on just-plain good vibes. Playing Pied Piper, Chappelle hands out Golden Tickets in his Ohio neighborhood and convincing the Fugees to reunite for the block party. Chappelle's fans should be aware that his own hilarious performances aren't new stand-up or sketch material, but mostly improvised riffing on the street and onstage. Most if not all of Chappelle's screen time finds him just kickin' it, with chipper youngsters (Ohio's Central State University marching band and the kids at Biggie's former grade school), adults (many stunned into inexpressive submission), and the performers. Long story short: it's a party and you're invited. Universal's unrated special edition of Dave Chappelle's Block Party adds approximately seven minutes to the film's running time, as well as extended music acts accessible by "icon-based branching." Beyond the flawless transfer and sound mix, the disc serves up two terrific documentaries. The first, "September in Brooklyn: The Making of Block Party" (28:08), offers more priceless glimpses of Chappelle at work. A particularly insightful inclusion is the story of the conference call that established the block-party philosophy and kicked off the collaboration between the large roster of busy artists (we get to hear portions of the call). The documentary delivers a broad cross-section of interview subjects, from the filmmakers (Chappelle, director Michel Gondry, music director Ahmir "?uestlove" Thompson, music supervisor Corey Smyth, production designer Lauri Faggioni, executive producer Skot Bright, and DP Ellen Kuras) to the artists (Talib Kweli, Blackthought, Dead Prez, Consequence, and Kanye West) to Cynthia Wood, one of the eccentric owners of the Broken Angel house. Among other subjects, the doc examines the troubleshooting necessary in the wake of a hurricane. A second featurette, "Ohio Players" (18:40), spends more time in and around Dayton, Ohio, with the lucky Golden Ticket holders who brushed with Chappelle and attended the block party. The doc particularly focuses on the CSU Marching Marauders and their hastily arranged bus ride to NYC. Filling out the disc are previews for Something New, Waist Deep, Slither, SNL: The Best of Cheri Oteri/SNL: The Best of Commercial Parodies, and Bring It On: All or Nothing. 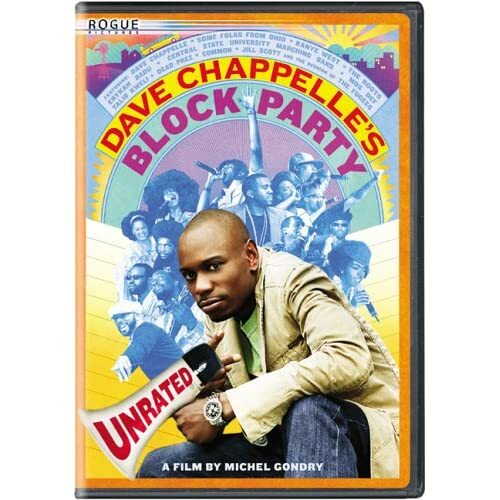 Dave Chappelle's Block Party (Unrated Widescreen Edition) is a can't-miss proposition for fans of Dave Chappelle and, well, good music. All site content © 2000-2019 Peter Canavese. Page generated at 04/18/2019 02:33:28AM.